VIDEO PREMIERE! The World's First Craft Beer Anthem "BrewHeads"! 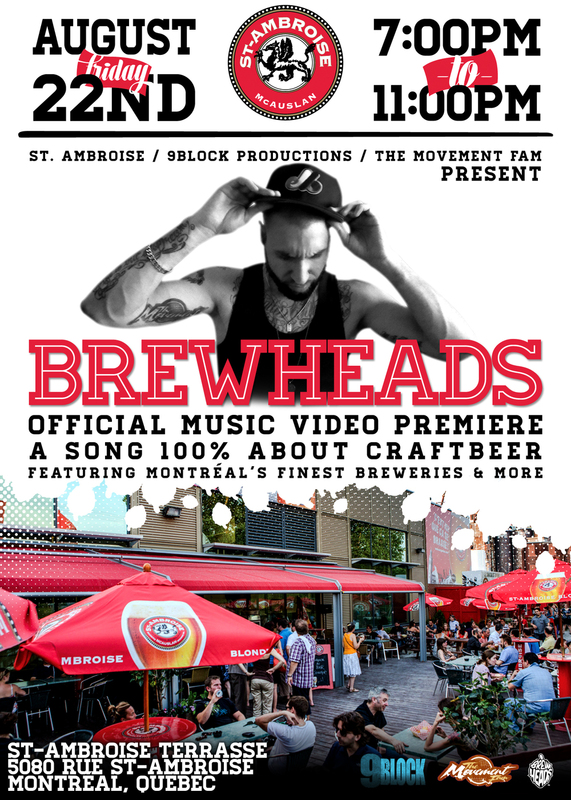 St-Ambroise x 9Block Productions x The Movement Fam Present the premiere of the world's first craft beer rap song - "BrewHeads"! Come down to the gorgeous terrasse by the Lachine Canal on Friday August 22nd from 7pm until 11pm - we'll be screening the video for the FIRST TIME IN PUBLIC! It won't be available online until Tuesday August 26th so this will be something special! So there's plenty of chances for you guys to get down and check it out! Australian MC Cee, now located in Montreal, created the song 'BrewHeads' (produced by Dr. MaD) after connecting with Phillip Hinson via Instagram. Phil owns BrewHeads, a craft beer merchandise company based out of Phoenix, AZ. The two had a mutual admiration for each other's business, so a collaboration was inevitable. The track celebrates all aspects of the world of craft beer unlike any other tune before it - this is most definitely not your typical 'let's get drunk' theme song. The incredible video was directed, shot and edited by 9Block Productions' Shane Russell and collaborator Richard Bastarache in microbreweries, brewpubs, dépanneurs and home brew shops around Montreal. Not only will you get to see the video, but Phil and Cee have created a super limited edition merch collab which will be available via www.thebrewheads.com for preorder starting Thursday August 14th! The black and gold box set contains a gorgeous BrewHeads Bière Sommelier Glass with 22 carat gold print; a custom 100% made in the USA snapback; special discount offers from 9Block Productions; and, of course, a digital download of the track (preorders come with Cee's album "This Is All I Know" or Cee & Dr. MaD's "Steps To The Peak" Deluxe Edition EP).